The Saunders-Roe SR.53 was a British prototype interceptor aircraft of mixed jet and rocket propulsion developed for the Royal Air Force (RAF) by Saunders-Roe in the early 1950s. As envisaged, the SR.53 would have been used as an interceptor aircraft, using its rocket propulsion to rapidly climb and approach incoming hostile bombers at high speeds; following its attack run, the aircraft would be able to return to its base by making use of the secondary jet propulsion instead. Although the SR.53 proved to have promising performance during test flights, the requirement for such an aircraft had been overtaken by rapid advances in surface-to-air missile technology, leading to reconsideration of the aircraft's purpose. In July 1960, the development programme was formally cancelled, by which time a total of 56 test flights had been performed. A pair of prototype SR.53 aircraft had been completed and used during flight tests. One of these was destroyed during one such test flight in June 1958. The other, the first prototype, survived and was preserved; it is currently on public display at the Royal Air Force Museum Cosford. The Second World War had demonstrated the importance of strategic bombing to modern warfare, and as the emerging Cold War developed, the development of new and more effective air defences against large waves of hostile bomber aircraft armed with nuclear weapons became a priority for many nations. During the war, Nazi Germany had extensively developed its own rocket-powered aircraft to augment its interception capabilities, in the final two years of the war, it had been able to deploy aircraft such as the Messerschmitt Me 163 and Bachem Ba 349 which, via rocket propulsion, had been capable of unparalleled rates-of-climb, enabling them to (at least in theory) rapidly sortie to intercept enemy bombers before they reached their targets. As the performance of these aircraft had become increasingly well known to the Allies, RAF experts were eager to explore and understand the underlying technology. In the aftermath of the war, German rocket technology was studied extensively by various members of the former Allied nations. Britain had quickly opted to commence a programme to develop liquid-propellant rockets with the aim of boosting aircraft during the take-off phase, known within the RAF as rocket-assisted take-off gear (RATOG), and during the climb-to-altitude phase of flight. In 1946, work began on a pair of new British-built rocket motors, the de Havilland Sprite with a maxiumum thrust of 22 kN (5,000 lbf) and the Armstrong Siddeley Snarler with 8.9 kN (2,000 lbf) of thrust; these rocket motors made use of different propellants, the Sprite used a high-test peroxide (HTP) monopropellant while the Snarler harnessed a methanol/water/liquid oxygen mix. During the early 1950s, both engines proceeded to the flight testing phase; however, some of the demand for their role to provide fighters with increased performance was soon being met by the increasing prevalence of conventional jet engines being equipped with reheat instead. In May 1951, faced with reports on the increasingly potential capability of, and thus the threat posed by, the growing Soviet strategic bomber fleet and that nation's newly developed atomic weapons, the British Air Ministry proceeded to draft an Operational Requirement, OR 301, which sought a rocket-powered interceptor that could attain an altitude of 18,000 metres (60,000 ft) in just 2 minutes 30 seconds. Many of the performance requirement laid out by OR 301 was due to the anticipation of rapid increases in performance by the opposing Soviet aircraft; by the early 1960s, it was suspected that these bombers might well be capable of supersonic speeds of up to Mach 2 with a potential operational altitude as high as 24,000 metres (80,000 ft). Accordingly, a capable defence interceptor that could form part of the nation's measures to counter this threat would need to be capable of similar speeds and an exceptionally high rate of climb in order to reach high altitude bombers in time. The development of the Sprite and the Snarler had led to the possibility of a more powerful rocket engine being developed as the planned powerplant for a viable "point defence" interceptor. The requirements of O.R. 301 were considered onerous, including a ramp launch and landing on a skid, and with the compliance of the companies which had approached to tender, the amended Specification F124T allowed for a mixed powerplant configuration along with the adoption of a conventional undercarriage. On 21 February 1951, the revised Specification F124T was circulated to half a dozen of Britain's various aircraft manufacturers to solicit their submissions. Saunders-Roe had not been one of the companies who received the Specification; this is likely due to the Ministry of Supply not considering them to be relevant, as the firm had typically been involved in the production of flying boats. However, Saunders-Roe was in fact interested in the new requirement, having been already independently conducting studies into high-altitude and high-speed flight. Maurice Brennan, the company's chief designer, had already directed members of the design team to study the prospects of rocket-propelled aircraft capable of flying at altitudes of up to 30,000 metres (100,000 ft) and had published a reported entitled 'Investigation of Problems of Pure Rocket Fighter Aircraft' at the same time that the Ministry had issued Specification F124T. Saunders-Roe approached the Ministry on its failure to follow conventional policy in not dispatching the specification nor an invitation to tender to the firm; as a result, on 24 March 1951, the Ministry asked the company to submit its designs alongside the other competitors. By the end of April 1951, Saunders-Roe submitted their detailed proposal. The proposed single-seat aircraft, designated as the SR.53, was capable of very high speeds, being projected as being capable of a top speed of Mach 2.44 (2,592.08 km/h; 1,610.64 mph) when at an altitude of 18,000 metres (60,000 ft), and a rate of climb of 16,000 metres (52,000 ft) per minute around an altitude of 15,000 metres (50,000 ft). An auxiliary disposable undercarriage could be used for takeoffs, along with cordite-based booster rockets. In the event of an emergency, the entire cabin would have originally been jettisoned as a means of providing the pilot with a means of escape; due to the work involved in developing this, it was instead replaced by a more standard ejection seat arrangement. The firm had quickly identified that that original unpowered 'glide home' approach to be dangerous and expensive; they approached the Air Ministry with their concept of a secondary jet engine for the purposes of powering the aircraft's journey home. The Ministry was enthusiastic on this concept; in May 1951, all interested companies were asked to examine this arrangement. The SR.53 was a sleek aircraft with a sharply-pointed nose, delta-like wing, and a T-tail. It was powered by a combination of a single Armstrong Siddeley Viper turbojet engine and de Havilland Spectre rocket engine, the exhausts of which were mounted one atop the other on the rear fuselage beneath the tail. Saunders-Roe had originally proposed to develop their own rocket motor to power the SR.53, having not been initially pleased with the performance of either the Spectre nor the Screamer; however, it was recognised that this would take substantial development work. By October 1952, the basic outline of the aircraft had been finalised, replacing the combined flap and ailerons of earlier proposed with slotted flaps, the Viper engine was relocated upwards and was to be fitted with a straight jet pipe rather than a bifurcated one, the tailplane was also moved to a higher position at the top of the fin. On 30 October 1952, the company received an Instruction to Proceed from the Ministry for the completition of three prototypes. On 12 December 1952, further refinement of the concept led to the release of the defined Specification OR 337. The changes of the defined specification mainly revolved around armament changes, adopting the Blue Jay infrared-guided air-to-air missile, which replaced the originally-envisaged retractable battery of 51-millimetre (2 in) rockets. During the first four months of 1953, Saunders-Roe had to perform a structural redesign of the SR.53's fuselage, wing, and undercarriage due to a determination by the Royal Aircraft Establishment (RAE) that the wing required a greater anhedral angle than had originally been designed for. On 5 May 1953, an advisory design conference was hosted at the Ministry of Supply focusing on the SR.53; three days later, a formal contract for the production of the three prototypes was received. Due to doubts within the RAF and the Ministry over the correct fuel/motor to select for the aircraft in order to meet the Specification, it was decided to issue a modified specification, and later a development contract, to A.V. Roe, who commenced work on their own rocket-powered interceptor, designated as the Avro 720. Of the six companies that tendered proposals, two were selected for development contracts: A.V. Roe with their Avro 720 and Saunders-Roe with the SR.53. Saunders-Roe, recognising that it would need to outdo the competing Avro 720 if the SR.53 was to be likely to survive, upon having been issued with the contract to build the three prototypes, set a schedule that called for a first flight to be conducted in July 1954, along with a projected service introduction date of 1957. However, Wood observes that this was far too ambitious as it did not leave time to address the complexity of the aircraft, nor did it accommodate room for delays in the supply of the separately-produced Spectre engine. Unresolved issues with elements of the design caused a series of setbacks, including one notable incident in the form of an explosion occurring during ground tests of the Spectre rocket engine. Construction of the first SR.53 prototype took longer than anticipated, in part due to de Havilland having problems delivering the Spectre engine on time, installing auxiliary equipment was also time-consuming. Accordingly, the maiden flight of the SR.53 began to fall further and further behind schedule. The date of the first flight was first set back to March 1955, and then into 1957. Unique challenges were posed by the HTP fuel, including the development of suitable storage bags and the fuel flow proportioner. In January 1954, the Ministry reduced its order from three SR.53 prototypes to two, which were constructed side by side at Saunders-Roe's Cowes facility. Development with the competing Avro 720 proceeded more smoothly; by 1956, its prototype was virtually complete and was viewed as being capable of flying up to a year ahead of the lagging SR.53. By September 1953, the programme to develop these aircraft came under scrutiny due to a need to implement cost cuts; as a result, the contact for the Avro 720 was eventually cancelled. One of the reasons for preferring the SR.53 was although the aircraft was developmentally behind, its use of hydrogen peroxide as an oxidiser was viewed as less problematic than the Avro 720's use of liquid oxygen, which posed a fire hazard. According to Wood, there was a preference for the HTP approach, as used by the SR.53, alongside an unwillingness to continue to support the operation of two different fuel programmes. However, the validity of this reason is undermined somewhat by the fact that Avro had been proposing to switch to using HTP and the Spectre, the same engine that was used by the SR.53. Another factor that had influenced the cancellation was the hesitancy of the RAF to back either project, the service had apparently wanted to wait until after flight evaluations had been conducted before it was to make any determination on its preference. During late 1953, Saunders-Roe commenced work upon a derivative design, which was designated as the SR.177. Brennan considered the lack of an onboard radar on the SR.53 and the Avro 720 to have been a viral flaw despite it not being a requirement of the specification, leaving the pilot dependent on his own vision and direction being provided by ground-based radar control. Brennan had also been dissatisfied with the use of the turbojet engine; he believed that a larger jet engine should match the steady supersonic cruising speed of the aircraft, and that the rocket motor should be mainly used for high performance climbs, turns, and rapid acceleration instead. Accordingly, the SR.177 was a much larger and sophisticated aircraft that would provide for more range and overall superior performance to the SR.53. It was sized to be able to carry a useful airborne radar, which Brennan had deemed to be essential for interception at the high altitudes in where the new fighter was meant to operate. The new, larger aircraft was also to be developed into separate versions for maritime use by the Royal Navy and for West Germany as well as for the RAF. Saunders-Roe worked on both the SR.53 and SR.177, the latter being worked on by a newly formed High Speed Development Section. In October 1951, Saunders-Roe obtained facilities at RAF Hurn, Dorset, to support the site's use as a base for test flights of the SR.53. This measure had been necessitated by a lack of suitable airfields on the Isle of Wight, where the company was based and typically conducted development from. To this end, the firm constructed a HTP storage faculty at the Hurn site; specialised radio aids were also installed and initially tested using a specially-modified Gloster Meteor which had been lent by the Ministry of Supply. This setup would ultimately remain unused as flying trials were centered at RAF Boscombe Down instead. On 28 June 1956, the completed first prototype, XD145, was dispatched for assembly by the Aeroplane and Armament Experimental Establishment at RAF Boscombe Down. On 16 January 1957, the first installed ground run of its Spectre engine was performed; on 16 April 1957, this was followed by the first installed ground run of its Viper engine. On 9 May 1957, XD145 conducted the type's first ground taxiing trial. On 16 May 1957, Squadron Leader John Booth DFC was at the controls of XD145 for the first test flight, following up with the maiden flight of the second prototype XD151, on 6 December 1957. Test results indicated "...an extremely docile and exceedingly pleasant aircraft to fly, with very well harmonized controls". Both prototypes flew a total of 56 test flights, with Mach 1.33 speeds being obtained. While testing at RAE Boscombe Down, XD151 crashed on 5 June 1958 during an aborted takeoff on its 12th flight. Running off the runway, the aircraft struck a concrete approach light, exploding on impact and killing its pilot, Squadron Leader Booth. The remaining prototype continued to fly with Lt Cdr Peter Lamb taking over the flight test programme. It was 1957 before the first SR.53 took to the air, just over a month after the infamous 1957 Defence White Paper had been published outlining the British government's policy to largely abandon piloted aircraft in favour of concentrating on missile development. At the same time, jet engine development had progressed a long way in the six years since the SR.53's initial design. Combined with the fact that improvements in radar had meant that any incoming bomber threat could be detected much earlier, the need for an aircraft like the SR.53 had disappeared, and the project was cancelled on 29 July 1960, with the third prototype (XD153) never built. 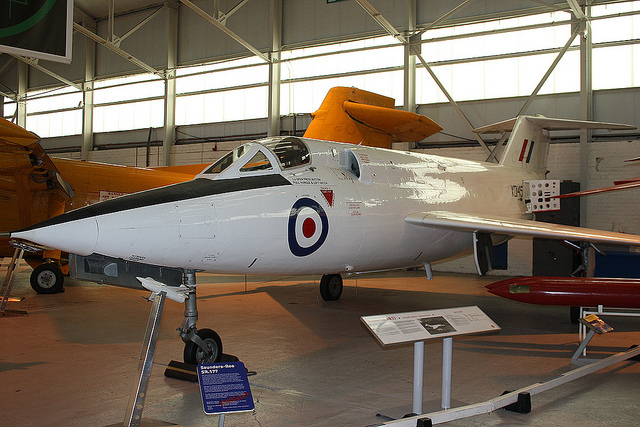 The Saunders-Roe SR.177 was a 1950s project to develop a combined jet- and rocket-powered interceptor aircraft for the Royal Air Force (RAF) and Royal Navy. It was an enlarged derivative of the Saunders-Roe SR.53, which was itself an experimental combined jet-and-rocket interceptor aircraft. The SR.177 principally differed from the smaller SR.53 in its adoption of a nose-mounted airborne interception radar unit, which allowed it to scan for and lock onto its own targets; a more powerful turbojet engine was also incorporated. In addition to British interests in the aircraft, the German Navy had also expressed their interest in the project and closely evaluated its progress with an eye towards its potential procurement. However, the SR.177 was ultimately cancelled as a result of changes in Britain's military policies in 1957. A much larger derivative of the SR.177 had been studied, which was designated as the SR.187, and was being developed with the intention of meeting the requirements of Operational Requirement F.155, however, this work was also cancelled in 1957. By the time of termination, approximately 90 per cent of the first prototype had been completed, while several other prototypes were in various states of completion. The prototypes were stored for several years while attempts were made to revive the project; while interest was present, including from Japan, nothing more came of the project and the remaining assets were broken up. In 1952, Saunders-Roe had been awarded a contract to develop a combined rocket-and-jet-propelled interceptor aircraft, which was designated as the Saunders-Roe SR.53. However, as development work on the project progressed, the shortcomings of the design became increasingly evident. Most particularly, as with the German rocket-powered interceptors of the Second World War, the range and endurance of such an aircraft were limited by the high rate of fuel consumption by the rocket engine. However, as turbojet engines developed and became increasingly powerful and efficient, new powerplants were quickly becoming available that would make such aircraft more practical. Maurice Brennan, the chief designer of the SR.53, had also become convinced of the necessity for an airborne radar unit to be carried by the aircraft, as the SR.53 was reliant upon on ground-based radar guidance and the pilot's own vision to intercept aircraft. In particular, it was feared that pilots would be unable to focus their eyes properly at the 60,000 feet (18,000 m) altitude that the SR.53 was capable of. Out of a combined desire to equip the aircraft with a radar unit and to make greater use of turbojet power, a more ambitious design began to be drawn up. While it had begun as an advanced design concept for the SR.53, upon the issuing of a development contract by the Ministry of Defence in May 1955 (to meet specification F.155), the project was given its own designation as the SR.177. As work continued on the SR.53, a separate High Speed Development Section was formed by Saunders-Roe to work on the SR.177. Initially, the SR.177 was a straightforward development of the SR.53, sharing much of the same configuration and equipment, and it was envisioned that the first test flight would take place during the first half of 1957. However, in February 1955, an extensive redesign of the SR.177, with the aim of making the type suitable for use by both the RAF and the Royal Navy, was commenced. Of the changes made to the aircraft, major differences included the repositioning of the jet engine to the lower fuselage lobe, which was now fed with air via a large, chin-mounted intake; the wing was also enlarged and blown flaps were adopted. The turbojet engine selected was the de Havilland Gyron Junior, capable of generating 8,000 lbf (36,000 N) of thrust. In September 1955, Saunders-Roe received instructions to proceed on the SR.177 from the British Ministry of Supply. The Ministry also gave instruction for the production of mock-ups, windtunnel tests, and the development of construction jigs for the manufacture of an initial batch of aircraft. From the onset, the SR.177 faced competition in the form of an enlarged derivative of the Avro 720, which had itself been devised as a competitor against the smaller SR.53. Avro promoted the 720 to the Royal Navy, hoping to win favour away from the SR.177, which was by this point had reached the detail design phase. The Ministry ultimately opted to cancel all work on the Avro 720, primarily as a cost-saving measure, as well as to concentrate development work on HTP-based rocket motors, such as those powering the SR.53 and SR.177. The most significant difference between the SR.53 and SR.177 was the latter's use of a jet engine with nearly five times the thrust of the one adopted for the former. While the SR.53 had relied mostly on its rocket engine for climbing, the SR.177 would be able to add considerable endurance by conserving use of its rocket for the dash towards a target only. It was expected that the added endurance would allow the SR.177 to perform roles other than pure interception; these roles were expected to include strike and reconnaissance missions. The SR.53 design had been considerably enlarged to accommodate the new engine, and the original sleek lines were forfeited for the chin-mounted air intake. Following the maiden flight of the SR.53 in May 1957, the development of the SR.177 became the main focus of activity at Saunders-Roe. At this point, the project was viewed as having considerable large scale potential, as both the RAF and Royal Navy appeared to be set to be customers for the SR.177. 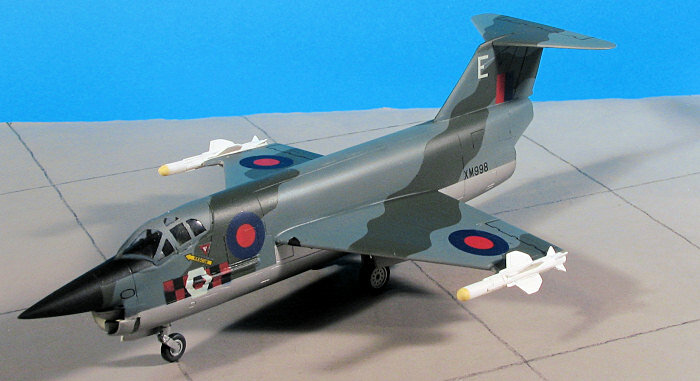 The RAF sought to operate it alongside the incoming English Electric Lightning interceptors while, according to aviation author Derek Wood, the Royal Navy also had considerable interest in the programme. When the development contract had been issued in May 1955, it reflected this dual interest. The Navy's requirements were defined in NA.47 while the RAF's requirements were specified in OR.337, which had been issued by the Ministry of Supply as Operational Requirement F.155. There was optimism that a joint aircraft for the two services could be developed, saving considerable expense, time, and effort. Negotiations on the exact number of aircraft sought by either service were protracted; but it had been established that there was demand for an initial batch of 27 SR.177 aircraft, and that sufficient tooling should be produced to enable the programme to transition rapidly to full-rate production. By April 1956, a consensus had emerged that, in order for the first five SR.177s to be completed by January 1958, these aircraft would be produced without any A.I. radar or the ability to support armaments. In July 1956, funding was secured for 27 aircraft to be produced, the first of which being expected to fly by April (later postponed to October) 1958. On 4 September 1956, a formal contract for the 27 aircraft was issued, which was sub-divided into four batches of five, four, four, and fourteen respectively, although the final eighteen were subject to evaluation and were thus pending confirmation. During 1957, a development contract for the SR.177 was announced for its use with the Royal Navy. By January 1957, the design of the main component jigs was 70 per cent complete while the component assembly jigs were almost 50 per cent complete; the manufacture of a quantity production batch was nearing, which would have likely been subcontracted to another aviation company due to the high level of workload at Saunders-Roe's Cowes facility. Armstrong Whitworth, who had already taken over work on the basic wing design of the SR.177, had been selected as the second production outlet for the type. The selection of a production center for the SR.177 was complicated by a favourable event; interest in the programme from the West German government. Since 1955, the revived German Air Force had sought a suitable high performance aircraft to equip itself with, and there were hopes that the SR.177 could become the foundation of a collaborative European fighter programme. The German Defence Ministry had first expressed interest in the SR.177 in October 1955; in February 1956, the British Government Committee on Security consented to discussions being held on the SR.177. The prospects of a large German order for as many as 200 aircraft, and for the SR.177 to be manufactured under licence in Germany by the recovering German aircraft industry, were soon being aired, of which the British government declared its openness towards. In January 1957, the Anglo-German Standing Committee on Arms Supply reported that General Kammhuber, the Commander-in-Chief of the German Air Force, was concerned that, due to a lack of available financing until April 1958, the delivery timetable may not be satisfactory. According to Wood, Germany was keen to issue an order as soon as possible by this point. During 1957, the fate of the SR.177 was to be subject to a massive re-thinking of air defence philosophy in Britain, being principally outlined in the 1957 Defence White Paper, which called for manned combat aircraft to be replaced by missiles. Very shortly afterwards, OR.337 was cancelled and the prospects of an order from the RAF had evaporated. This was a serious blow, while it the Royal Navy and Germany remained potential customers for the SR.177, the confidence of both parties was shaken by the move. Work on the SR.177 continued for a little longer, however, in the anticipation of continued interest from Germany. In September 1957, Aubrey Jones, the Minister of Supply, was keen to support the programme and had agreed to continue funding development of five of the six prototypes. However, according to Wood, the SR.177 was subject to political in-fighting between Aubrey Jones and Duncan Sandys, the minister who had been the prime advocate of the Defence White Paper. While Jones assured German officials that the SR.177 project was continuing, Sandys contacted them to inform them that the aircraft was effectively dead. These mixed messages led to considerable confusion and apprehension within the German Defence Ministry. Further difficulty was added when, in response to lobbying by Rolls-Royce Limited, the German government insisted that the Rolls-Royce RB.153 engine be used in place of the Gyron Junior, causing Saunders-Roe to work on a further hasty redesign of SR.177. The German government also decided to change its priorities from seeking an interceptor aircraft to acquiring a strike fighter instead, leading Saunders-Roe to redesign the aircraft for this role. However, even with Heinkel preparing to manufacture the SR.177 locally under licence, Germany chose to withdraw support from the venture in December 1957. The Minister had visited the German government in November 1957 as the Germans wanted the arrangements to be between governments instead of between their government and Saunders-Roe. Of the remaining aircraft under consideration, the West German Government chose to purchase a development of the American Lockheed F-104 Starfighter interceptor instead to meet the role of "high-altitude reconnaissance machine, a tactical fighter-bomber, and an all-weather fighter", along with the majority of European governments. This Lockheed coup, known as the "Deal of the Century", caused major political controversy in Europe and the West German Minister of Defence Franz Josef Strauss was almost forced to resign over the issue. During later investigation into Lockheed's business practices, it was discovered that Lockheed had paid out millions of dollars in "sales incentives" in each of these countries in order to secure the deal. Prince Bernhard of the Netherlands confessed to taking more than one million dollars in bribes from Lockheed to buy the F-104. Following the withdrawal of German interest and there being no requirement for the SR.177 by the RAF, the existing Royal Navy requirement was considered not worthwhile to proceed with. Accordingly, the Ministry of Supply soon chose to cancel the project. On 24 December 1957, a letter from the Ministry was received by Saunders-Roe, announcing the decision to terminate. Saunders-Roe announced that it expected to make 1,000 workers redundant as a result of the termination. As the jigs and near-complete aircraft was disassembled during the New Year, it was decided that the aircraft assemblies themselves should be stored in the event of the project being revived. In 1958, the SR.177 received one last burst of interest when Japan, which was interested in developing a rocket-jet fighter itself, approached Britain with a request for quotations for the purchase of the two prototype SR.53s along with the completion of two SR.177s. However, due to a lack of backing from the British government, this initiative did not come to anything; the Japanese ultimately turned to the F-104 as well. Woods summarises the cancellation of the SR.177 as: "...it could ultimately have been built in hundreds or thousands. Due to ridiculous defence policies and a complete lack of Whitehall inter-departmental collaboration in the technology field, one of the most promising projects in a decade was destroyed". Powerplant (Jet): 1 × de Havilland PS.50 Gyron Junior turbojet with afterburner, 14,000 lbf (62 kN) thrust. Shorter version, with SR.53 included. I may have missed it in your excellent write up but it wasn't just the fact that Lockheed basically bribed NATO into buying the F-1045, the US Government refused to let Military Aid funding be used to support the programme that killed it off. We were still pretty broke at the time and needed US funding for many of our defence programmes, which was seen as a way of support NATO.